On December 25, 2015, my trail camera snapped these photos of an Eastern Wolf (Canis lycaon) at my property near Carnarvon, north of Minden. Note the lack of snow! 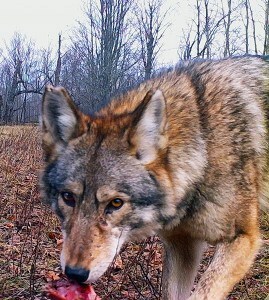 Note: Click here for background information on the Eastern Wolf, also known as the Algonquin Wolf. 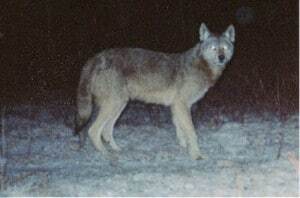 I have uploaded four videos of what I believe are Eastern Wolves. The videos were filmed at my farm in the Haliburton hinterlands. 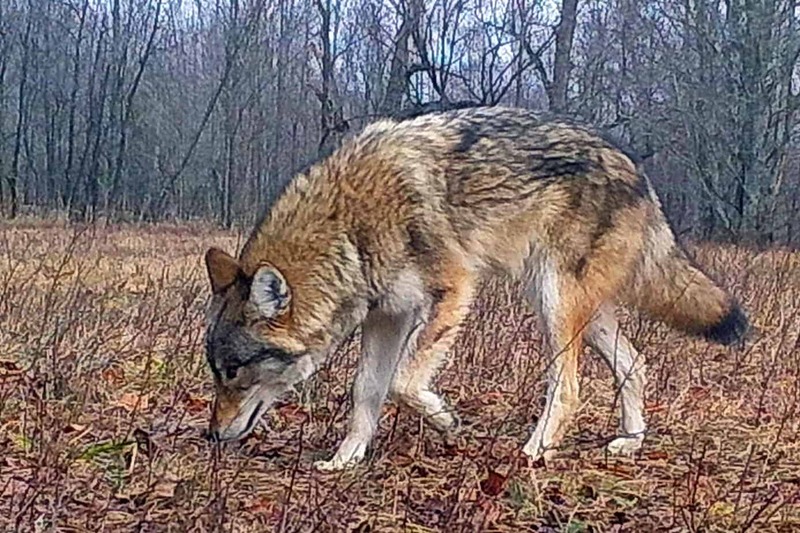 My understanding is that Eastern Coyotes have larger tails and ears, shorter legs, a more pointed nose, and generally a more multicolored coat. Nonetheless, it’s difficult to be certain. I understand that coyote genes flow throughout the Eastern Wolf population. That may not be a bad thing. Recall Mark Twain said when speaking of his dog, “He wa’n’t no common dog, he wa’n’t no mongrel; he was a composite.” We’re all composites and stronger for it. Seeing animals in the winter is all about food. I therefore put scraps of food out in a concentrated pile while setting up a video camera. To make sure we don’t frighten the animals, filming is done in infrared at night and regular colour during the day. My dream for the last twenty years has been to photograph a cougar, but everything but has walked by. 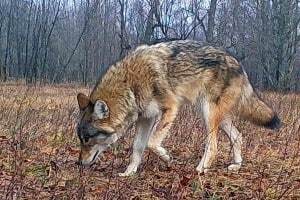 There will be more videos to follow when I get time to edit them: fishers, foxes, raccoons, snowshoe hares, and more wolves. I would suggest you put the video on full screen and watch to the end because wildlife is unpredictable. Click here to see videos.